After doing some work up in Berkeley Heights, the group and I decided to grab a bite to eat for lunch. One local we were with recommended a place nearby called Delicious Heights, so we took his suggestion and made our way to the bar for some food. Food for me always means wings, and I was eager to try a new place. We made our way into this fancy-type restaurant, passed by the booths, and grabbed a seat at the bar. I’m not a very formal person, and sitting at the bar seems to be more my speed… and it didn’t hurt having a cute bartender either. I grabbed a menu to see what was offered wing-wise and wasn’t really amazed to find that there was only one option. Needless to say, that’s what I ordered. 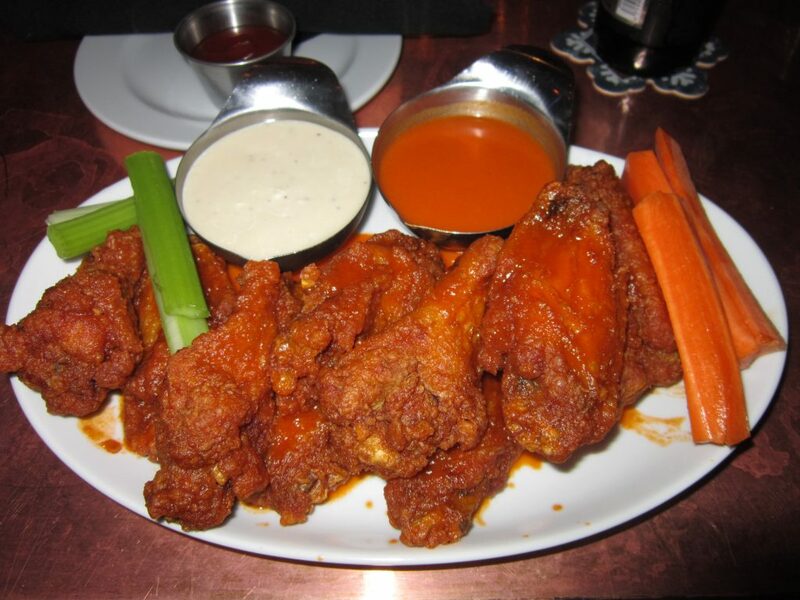 The wings made their way to the bar, and right off the bat I could see that they were a good size. Nice and meaty, heavily breaded, and ready for the taking. I’m not such a big fan of breaded wings because they tend to get soggy, but these were not drowning in sauce so they kept their crisp (for a little while, anyway). The meat was juicy and kind of tender, but it was the sauce that really brought the flavor to the dish. The sauce was a nice orange hue and wasn’t too thin or too thick. The flavor was unique because you could taste the hot pepper, but it also had a sweetened tangy flavor that I couldn’t put my finger on. Almost like a honey Worcestershire mix with the emphasis on the honey. It was a different taste than the normal wing flavors I would expect to find, but by the same count, wasn’t that bad at all. The only thing I wish was different would be the heat. It didn’t really have much, and I prefer a little kick to the mouth every now and then. I wasn’t planning on searching for wings today, let alone good wings at a fancier establishment. But I have to say that I was pleasantly surprised that their wings were better than expected. I wouldn’t take a special trip for them, but it’s nice to know that even when I am not looking for good wings, there are still places out there that surprise me.